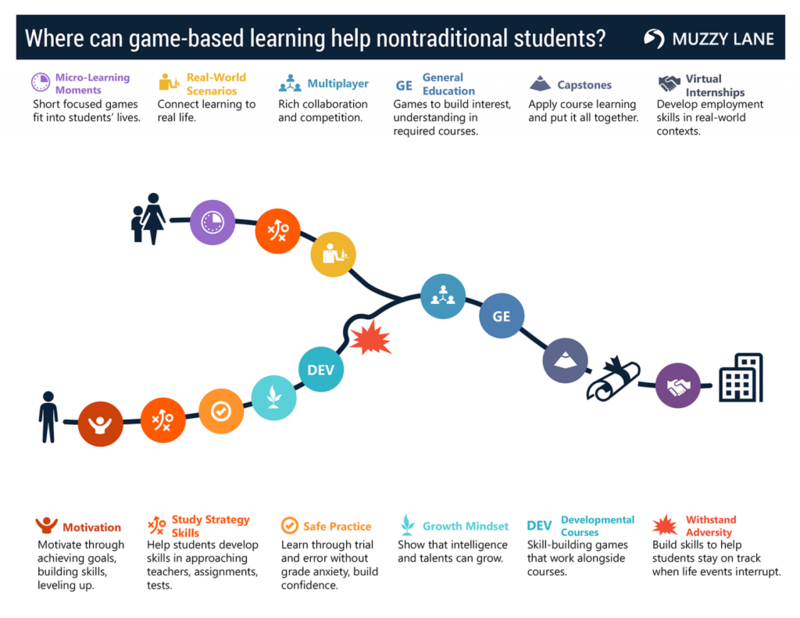 Muzzy Lane Software has released The Potential for Game-Based Learning to Improve Outcomes for Nontraditional Students, a report on the findings of a research grant awarded by the Bill & Melinda Gates Foundation. The goal of this research was to investigate how game-based learning can help improve outcomes for nontraditional students in higher education. Muzzy Lane conducted one-on-one interviews with educators across the country, held focus groups and interactive design sessions with students from community colleges and adult education programs, and collected over 1,700 student surveys. For this research, we defined nontraditional students as students who may be returning to school after pausing their education; working and balancing family and parenting responsibilities while going to school; lower income; English as a second language learners, and the first members of their families to attend college. For our focus groups and surveys, we looked for students that met at least two of these criteria. Students expressed a consistent need for mobile first activities and assessments that make productive use of their time and fit into their busy and unpredictable lives, helping them study on all of their devices while juggling the responsibilities of family, work, and school.